This week we would like to profile sun123 who has lost an incredible amount of weight and has turned her overall health around. Her story is so inspirational we just had to share it with you. My extreme obesity handicapped me from the most basic activities requiring standing or minimal walking. Reversing it felt overwhelming and hopeless so I hadn’t pursued it. A caring but persistent friend intervened. My “Ah Ha!” moment was realizing that the time required to lose the weight would pass anyway. After it passed, I could be unhappily the same size, or I could use the time to reclaim my life. I had not dieted for many years. Previously, I’d lost weight with Slim Fast, Weight Watchers and general calorie reduction plans only to regain it and more. I was later diagnosed as insulin resistance due to PCOS. My doctor recommended South Beach, which steadied my blood sugar and controlled my hunger. The most significant change was my attitude. I didn’t want or hope to lose weight. I was going to lose the weight With that decided, I changed the diet, activity and lifestyle. My insulin resistance caused processed carbs to cause havoc on my appetite, so they were replaced with good carbs. I switched to sugar free and fat free food versions when available. I incorporated healthy fats via nuts and salmon into my diet. I found or made opportunities to walk. I removed the conveniences that allowed me to be less active. I stopped hiding, and instead proactively reconnected with friends. New and healthier habits became part of who I am. 4. What was the most important change? The most important change was my mindset. Not only could I find my way back, but there was a smaller, healthier “me” just waiting for my arrival. I didn’t have to do anything overwhelming or even outstanding. I just had to commit. The rest would fall into place – and it did. The losses accumulated. The fleeting experience of eating certain types or amounts of food didn’t outrank the priority of removing my excess weight. I stopped my denial and acknowledged that the temporary gratification of overeating clearly was not worth the resulting long-term feelings of being defeated and unhappy. 5. How did Calorie Count help you to lose weight? It has been a major factor in my success in numerous ways. The most obvious for me is by providing a community of like-minded members who have turned their dreams into goals. In addition, I have learned from the site and its members. 6. Did you rely on particular features or social connections? The weight log and forums have been especially helpful. 7. If so, please describe them and tell us about any lessons you learned. The weight log is very rewarding, allowing me to “see” my progress. More importantly, there are also the forums of like-minded members determined to improve their lives, which provides mutual support. By observing other members’ fluctuations and plateaus, I’ve learned not to get caught up in my own and continue making good choices, allowing the numbers to work themselves out. I’ve also been educated about not sabotaging my weight loss by under eating. 8. What was most challenging about losing weight? I have been very fortunate. I had long felt I could not turn my situation around so when I realized I could, there was little that was going to get in my way. Being consistent with exercise was one challenge. Another challenge has been binges, which thankfully have been rare. My participation and accountability in on-going threads has fortunately helped me rein them in and get back on track. 9. How long did it take you to see results? Because I started 300 lbs overweight and wore loose, oversized dresses, my weight loss took longer than normal to be noticed by others. I personally felt the change almost immediately due to my changed mindset and the new sense of empowerment. I felt better about myself than I had at much lighter weights when eating was out of control and I was gaining. From a physical perspective, each small improvement meant a lot as well, since it made my life less of a challenge. 10. When did you realize that you were a success? At my first weigh-in. My biggest challenge was overcoming the false, self-imposed belief I couldn’t lose the weight. I had to use a special physician scale able to weigh myself after being driven to the hospital and helped through the hallways to the scale. When I saw that first loss, I knew that was success. I just had to do today what I did yesterday and repeat it tomorrow. This would get me to my goal and there would be successes all along the way. 11. How do you prevent relapse? I use a calendar to list several weekly expected weigh-in goals in advance. I aim just under my expected losses to allow for plateaus along the way. The upcoming goal each week has been an effective reminder that if I were to relapse how much more difficult it would be to catch-up and get back on schedule. I also use goals. For short term, I hang a clothes item in my office of what I want to be able to fit into next. For long term, I schedule trips with expected weight goals so nothing in between is more important than how I’ll feel during my trip being at my weight goal. 12. 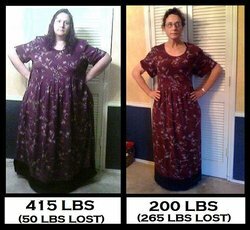 How has your life changed now that you’ve lost weight? I am no longer handicapped. I don’t have to second-guess everything I do that requires movement. I can stand and walk without counting down the minutes I will last. I don’t even think about it. I just do it. I also am genuinely happy. Problems haven’t disappeared, but their effect is minimized because I’m so incredibly grateful to have my life back. I am no longer mistreating my body. Before my weight loss, positive moments were burdened with the consistent unhappiness resulting from my overeating. Now frustrations are counteracted by my strong appreciation of how my overall life is improved. 13. What five tips do you have for other dieters? Be aware in your history what’s worked (as long as it’s healthy) and what hasn’t to increase your odds of succeeding. Find and surround yourself with peers who have a similar, positive health attitude that will hopefully reinforce your own. Keep a steady stream of highly rewarding goals to keep you focused and get you past temptations. Schedule in advance reasonable expected weekly weigh-in goals to avoid setbacks. Do not minimalize your progress and praise yourself for all achievements – big and small. 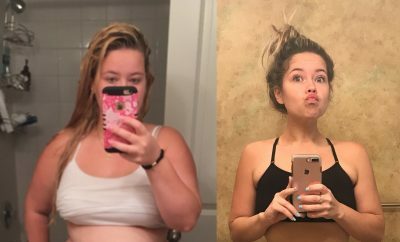 ← Previous Story Weight Loss Before and After: I Quit Smoking And Dropped 65 Pounds! 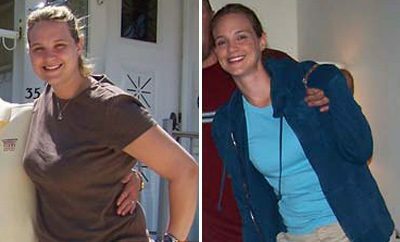 Lisa decided to enter a 12 week challenge to motivate herself to lose the weight.